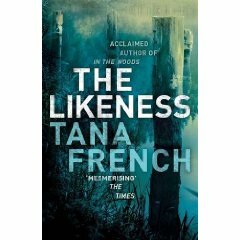 I’ve been waiting to read The Likeness by Tana French for so long and finally it appeared in my library after many, many months. I was really impressed with French’s previous novel In the Woods (a sort-of prequel to The Likeness in the sense that it also features Detective Cassie Maddox) which was atmospheric and thrilling and didn’t really wrap up the mystery in a conventional sense. It was like a breath of fresh air and reminded me a lot of Susan Hill’s Simon Serrailler mysteries. In The Likeness, French puts forth an incredible premise and one I hadn’t really seen anywhere else. A body of a young woman is found in an abandoned cottage, stabbed. Detective Cassie Maddox is called out to view the body and comes face to face with her double and undercover alter ego, Lexie Madison, who she had put to rest many years ago. Who was this woman and why did she die? This opportunity is too good to miss for Cassie’s ex-boss Frank who created the identity of Lexie Madison, and although her boyfriend Sam disapproves, Cassie agrees to go undercover again to find the killer. She slots back easily into the life of an English PhD sharing a beautiful, crumbling house with Lexie’s four best friends, all students at Trinity College Dublin. The house is in Glenskehy, a small village where no love is lost between the locals and the inhabitants of the house. As well as finding Lexie’s killer, she must also stay a step ahead of her friends, who spend all their time together, and get to the bottom of the biggest mystery of all: who was Lexie? Overall I thought the book could have been a little shorter and there were several instances where I couldn’t understand why Cassie didn’t follow her orders and kept secrets from her boss Frank, because you knew this would just endanger her (as in all thrillers and horror films, I always end up shouting at the screen when a character willingly goes alone into the dark when you know something bad would happen). But she had her reasons, and French has created a wonderful, original and slightly flawed character who understands loss, compassion and above all, her job. Cassie comes with baggage, and French gives her the opportunity to sort herself out. Lexie and her friends who shared their life in the crumbling house and studied together is strongly reminiscent of Donna Tartt’s The Secret History. Their refined air which sets them apart from their peers, their unbreakable bond of friendship and their taut and extremely private inner lives which only needs one event to crack their polished veneer really made me want to reread Tartt again (and I’m going to this year). Although I found The Likeness to be a slow start, it picked up pace and was overall a very enjoyable read. *You can read about Tana French’s top 10 maverick mysteries here. I read this for the Thriller and Suspense Challenge 2010. I enjoyed reading her books! I can’t wait for her next release!! I’ve been meaning to read this and Into The Woods for some time – but if I hadn’t, you would have sold me with the comparison to The Secret History. I so loved that book! Melody: Me too, it’s coming out later this year, I think. Nymeth: I just added a link to French’s top 10 maverick mysteries and guess who comes up no. 1? I do love mysteries but it is good to find one that is a bit different – i guess that it is all about maintaining individuality in a quite restrictive genre. Great post – thanks very much for posting and I am so enjoying discovering your blog. I was nervous about this one because I really enjoyed her debut, but I enjoyed The Likeness every bit as much. While on one hand I could see where some might have felt that the writing might have been tightened a bit, I was quite happy to shush my inner editor because I was enjoying the characters’ stories so much. I have never gotten around to reading The Secret History, but I think I would like it very much. I loved In the Woods and have The Likeness waiting for me–the premise sounds interesting! Did you know she has a third book coming out this summer? Hannah: Mysteries are my favourite genre too, but you are right, it’s nice to get shocked out of your comfort zone once in a while. BuriedInPrint: I think she did a great job with the characters as well, I could almost picture them. I don’t normally mind thick books, but some days you just want them to be a tad slimmer. But I’m not complaining. Danielle: Oh, I think you would like The Secret History. I would be interested to hear what you think of it. And yes, I think French’s new book is out this year featuring the some of the same characters. Can’t wait! I haven’t read this writer, but you make The Likeness sound fascinating, so I shall seek it out. I’ll be interested to see what you think of it. Oh wow, I am LOVING the sound of this book! You had me even before the mention of The Secret History (one of my all-time favourites) so now I must hunt it out! Ha ha, glad to be of service. I hope you like them. Tana French has a new book out this year as well, can’t wait to read it.